Philip Coppens faces down the academic establishment once more with this fascinating and rather compelling overview of prehistory across the globe. The title of the book infers a dreamy search for Atlantis et al, but, as the author eventually notes, most of the cases he's looking at are of excluded, rather than lost, civilizations (p275). In other words, there's plenty of archaeological evidence for these ancient conurbations and their peoples - it's just that they don't 'fit', and are therefore quietly sidelined by academia whose sclerotic games of catch-up can last decades. Inevitably, the work of amateur archaeologists finds itself falling foul of the professional establishment, but even 'real' archaeologists can find their work furiously denigrated by their colleagues when they attempt to turn the clock of civilization back through time. The early chapters of the book deal with such cases as the controversial Bosnian pyramids at Visoko, Sarajevo and those at Xi'an in China. The European pyramids in particular seem to suggest a civilization that predates Egypt and Sumer, and the author confidently predicts that these enigmatic structures will shake the foundations of accepted pre-history in years to come. He may be right. Authoritative opinion is split on these monuments, but seems to be moving in the direction of 'Old Europe'. Turkey's more famous sites of Göbekli Tepe and Çatalhöyük potentially extend things back still further, and may provide us with the origins for the mysterious folk who set up shop in Mesopotamia over 6000 years ago, founding Sumer. These, as in many similar cases throughout the world, provide not just a scientific tussle of opinion, but also the potential for the stoking up of nationalism as previously ignored parts of the ancient world vie for the prestige of being the oldest cradles of civilisation. But Coppens drives the argument in a different direction - the world of prehistorical times resembled more a global village than dispersed pockets of emergent civilisation. The tin trade across the Atlantic seaboard is a case in point - supplying one of the 'ingredients' for bronze. The author argues that the other elemental ingredient, copper, may have come from Michigan, where immense quantities of copper ore were mined around 6000BC, yet appear to have disappeared from the area with no obvious destination in North America. Coppens controversially joins the dots, and he seems to have a good point. In so doing, he calls for ocean-going vessels regularly crossing the Atlantic some 8000 years ago! Perhaps there is some reason to be optimistic that this was possible. Were the Megalithic folk really capable of traversing oceans? Coppens links there civilisation to Atlantis, suggesting that an immense system of concentric dykes in France, centred on Sens, might be a reproduction of the lost continent. Such arguments I have more difficulty in accepting, although they are certainly imaginative and carefully argued. But what I don't doubt is that rising sea levels and encroaching deserts have consumed the coastal settlements of the prehistoric ancients in Europe and North Africa, creating gaping holes in our knowledge. Whether the megaliths and dykes of Gaul offer the solution I'm not so sure. Coppens then reviews some well known controversies - the Ica Stones; what may lie below the Sphinx (secret chambers, lakes, Halls of Records...); the Tarim mummies in western China. This last example exemplifies the general thrust of his thesis. Although the Silk Road's antiquity is not disputed, the discovery of Celtic folk in China in the distant past provides much food for thought. And yes, there are plenty of typos in this book, where an over-reliance on electronic spell checkers has created some entertaining misnomers. Anyway, the above discussion evolves as Coppens explores the possibility that Caucasians may have originally come from China's Tarim Basin! I think he is often guilty of using strong rhetoric in his writing, but can provide good balance and counter-points, too. Finally, Coppens argues that the underpinning of emergent prehistoric civilization was religion, or at least a spiritual form of it exemplified by the worship of other-worldly imagery like that of the Lascaux cave paintings. These caves were the first real cathedrals, he explains - not dwellings, but religious shrines below ground. I think he has a point, although I'm sure politics and the desire for power and expansion also played their part in the transformation from hunting and gathering to farming, domestication of animals and grain, and thence civilisation. What this book provides best of all is the sense that this process may well have taken place millennia before the current official dating allows. 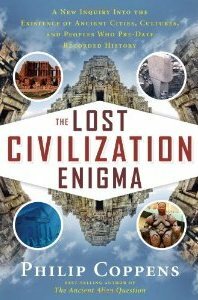 And as those dates sweep back towards the end of the last Ice Age, and the probable catastrophe that triggered the extreme climate change during that period, the potential for truly 'lost' civilizations emerges. Subtitled "A New Inquiry into the Existence of Ancient Cities, Cultures, and Peoples who Pre-Date Recorded Civilization"